MK Ben Ari acted on his ultimatum that he would move to recover sheep stolen from Jews by Arabs if authorities continued to turn a blind eye. Realizing an ultimatum made by MK Michael Ben-Ari (National Union) to unilaterally act against Arab sheep thieves if police continue to look the other way, a group of several dozen Jews Thursday tried to recover a herd of sheep that was stolen from Jewish shepherds in Tel-Zion. 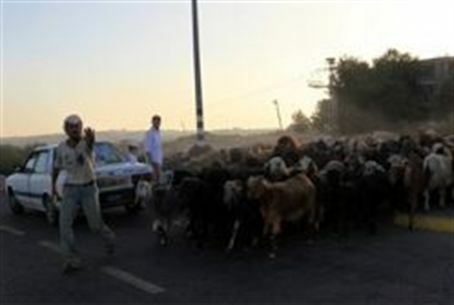 At about 2:00 A.M., a group of Arab rustlers entered the Jewish community of Tel-Zion and stole a flock of sheep worth 50 thousand dollars, smuggling them back to their own village of Qalandiya. In an conversation with Israel National News, the flock's owner said, "Last night the Arabs stole 30 sheep. Just two years ago I suffered a similar theft and it took me a long time to recover. I built that herd myself and everything went down the drain." "I went to the army and the police and they arrived at the scene and just told me 'don't worry,'" he continued. "I simply feel helpless. Nobody lifts a finger, I told the commander of the sector: if you are silent about the theft today it will cost human life tomorrow." MK Michael Ben Ari then turned to Israel's Ministry of Public Security, and said: "If within three hours the security forces do not enter the village, I'll go to Qalandiya myself to pull out the herd. Today it's sheep, tomorrow it's slaughtered children. I will not allow an Itamar II." At about 7:00 P.M. a group of several dozen Jews flocked to the entrance of Kochav Yaakov near Tel-Zion and, led by MK Ben-Ari, and his parlimentary aides Baruch Marzel and Itamar Ben-Gvir, headed for Qalandiya to liberate the sheep. MK Ben-Ari said, "Where the police will not act, we are forced to act to bring back our lost sheep." According to Baruch Marzel, who spoke with Israel National News by telephone, the activists managed to evade police and army officers until they were within a few hundred meters of Qalandiya. Marzel said, "The officers promised us they would go in and return the sheep tonight. This is what we wanted... to force their hand. Before we did this they would not even speak with us." Israel National Police spokesman Micky Rosenfeld refused to discuss the incident itself, telling Israel National News, "I'm not going to deal with this right now because right now we're dealing with much more important things like heightened security and the marathon. This isn't important. Just to put things in perspective for you." The problem of theft - and sometimes outright robbery - targeting Jewish farms by Arabs in southern Israel has been pervasive for many years, with losses to rapine rising to tens of millions of shekels per annum. Such incidents sometimes have tragic endings. In January 2007, Jewish farmer Shai Dromi was aquitted of manslaughter after he was put on trial for killing one of four Bedouin men who poisoned his dog and came in the night to steal his flocks. Dromi, who feared for his life, shot at the men's legs in self-defense, but one of them died of bloodloss after the incident (Dromi did attempt to administer first aid at the time). Dromi's case garnered national attention and resulted in the Dromi Law, which allows farmers to protect themselves and their property.